Salondotcom, which I understand to be relatively widely read, is a fairly sloppy place, or at least seems that way, given the high production values of its web design, which contrasts quite a bit with the writing therein. That’s not here or there, but they do have a theoretically interesting article about the removal of “wolves” (there’s only one kind, apparently) from the protected species list. Nevermind the very odd fact that a pack of wolves is called the “Nez Perce,” the point is, Limpy, aka 253M, is the hero of the story, and has recently been shot dead by a rancher (apparently the impetus for the piece). I’m sure lots of readers have opinions on this measure that go beyond considering wolves to be people (Native American people in particular, it would seem), and since I have the privilege of writing from complete ignorance, I’m anxious to hear: Should wolves be endangered? Protected? Killed? What the dilly, yo? Hilarious article from the Guardian by Fraser Lewry, a poor man who had to give up meat for a week, and SUFFERED. He is also eating his way through the animal kingdom alphabetically. Here is his take on “P”, Python and Pigeon Pie (seriously.) I hope he gets a book out of it. Meanwhile his blog is here. 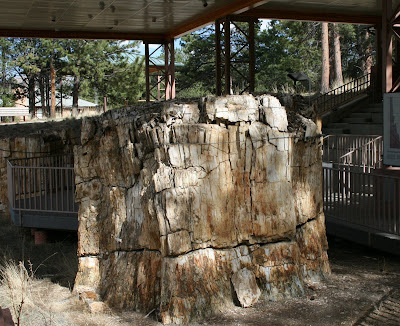 Last weekend, Connie and I took a daytrip drive in the mountains and one of our stops was Florissant Fossil Beds National Monument. The deposit here was created by a volcanic eruption during the Eocene. 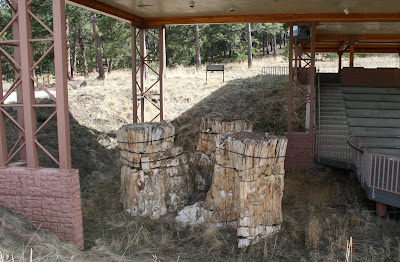 The most spectacularly evident remains are these petrified redwood stumps such as the one above. And this one. 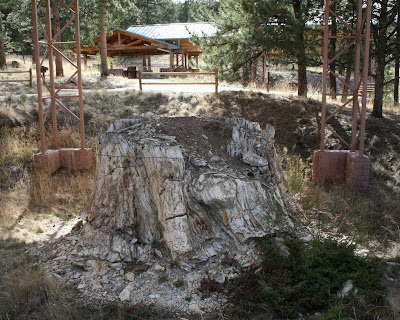 It’s nice to think of a big redwood forest here in Colorado, even if it was 37 million years ago. Other than these giant stumps the finer-grained sediments here have preserved magnificently detailed fossils of small leaves and insects. We were a little short on time, so I just grabbed pictures of the big stuff. 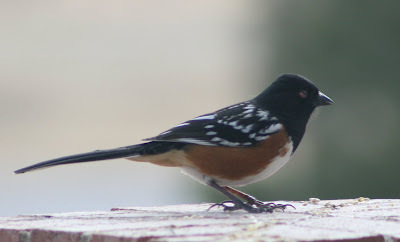 You can click through the web site I linked to see pictures of some of these. 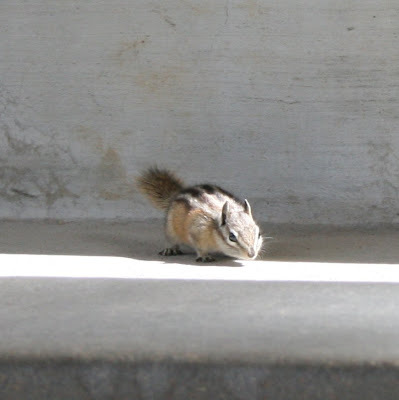 This chipmunk accompanied me through the covered “theater” area. I must have looked like a soft touch for a snack. Meanwhile Brian Switek at Laelaps adds more, and Nemo Ramjet writes a ribald science fiction take on Hatzegopteryx, another giant flyer, here for Brian’s edition of The Boneyard. More Paleo: a while back, Brian interviewed Robert Bakker, a guy who probably has done more for the modern view of Dinosaurs than anyone, and more for the image of paleontology than anyone but MAYBE Jack Horner. Trouble is, Bakker is (subtly, and with no taint of Creationism whatsoever) religious, and a bunch of wannabe P J Myers were apparently offended that anyone religious could dare be a scientist. Brian generously gave Bakker a forum to respond here, and the replies were– infuriating. Am I getting old? Is it the nature of the web, or– what? Bakker seemed to me to be sane, courteous, and open- minded– his critics (who I think are all young and full of fury) seem positively venomous. Two more Paleo notes: just received a wonderful book from Australia called Feathered Dinosaurs with paintings by amazing wildlife artist Peter Schouten. I think they are the best painted Dinos ever done. The book won’t be available here or in the UK for six months or more, but as soon as I scan an example I’ll review and tell you how to get it from Down Under. Finally, someone in the maze of Azhdarchid links above asked how it might be pronounced. If it is of Kazakh derivation the “zh” is a sort of voiced “j”– “azhj- dark- id”. Health officials are warning New Yorkers to stay away from an illegal aphrodisiac made from toad venom after the product apparently killed a man. Somehow I think there’ll be a Darwin Award nomination coming out of this. “One of South America’s few remaining uncontacted indigenous tribes has been spotted and photographed on the border between Brazil and Peru. The Brazilian government says it took the images to prove the tribe exists and help protect its land. Well, us professional archaeologists and the thinking public know this is escapist fiction and don’t worry much about it. Anyone who knows about professions portrayed in entertainment media (lawyers, crime scene investigators, police etc.) recognizes that what you see on the screen bears little resemblance to reality. If Indy takes this to an extreme extent, so what? So, ignore Silberman. I’d guess 99.9% of archaeologists are perfectly content to bask in the reflected glory of the fictional imperfect archaeologist Indiana Jones. Most professions don’t even get to do that. I mean, there must be thousands of people who wish there was an “Indiana Jones” of accounting or urban planning. The NY Times tells us that the demand for guano (bird droppings) is rising due to the petroleum-related cost rise for synthetic fertilizer and guano’s increased use as a fertilizer for organic foods. The article gives a very interesting narrative of the effect of guano mining on Peruvian history and the natural environment of the area. You can’t blame the Peruvians for clamping down on control of this resource. With economic conditions as they are, what else were they guano do? The Times also is carrying a tangentially related article illustrating the current economic climate: As Oil Prices Soar, Restaurant Grease Thefts Rise. PETA successfully pressured an upstate New York school to end a well- regarded course in the ecology of food in which willing students raised and slaughtered chickens. It was much like a 4H program but more balanced– vegetarian students were encouraged to address the class, there were lectures on eating less meat, and they were even shown a PETA film! The administrators caved, whining “it’s never a happy feeling saying you’re bowing to a public pressure you don’t agree with, and yet we all make those decisions from time to time.” I’d call them spineless but it would be an insult to invertebrates. Wake up, people– they are everywhere. Some dog breeders I know were thrown out of a seminar for law enforcement in Albuquerque lead by a HSUS activist, on the link between animal abuse and domestic violence. Turns out the sherrif of Bernallilo county, like the mayor, is an AR activist and anti- hunter. They ARE out to get us– they almost got statewide spay neuter last year. I’m too old to move to Kazakhstan but if this goes on I may have to.